You can get 5 songs spinning on multiple royalty paying radio stations at a very low price. At $4,250.00 We guarantee your songs get placed within 24 hours. 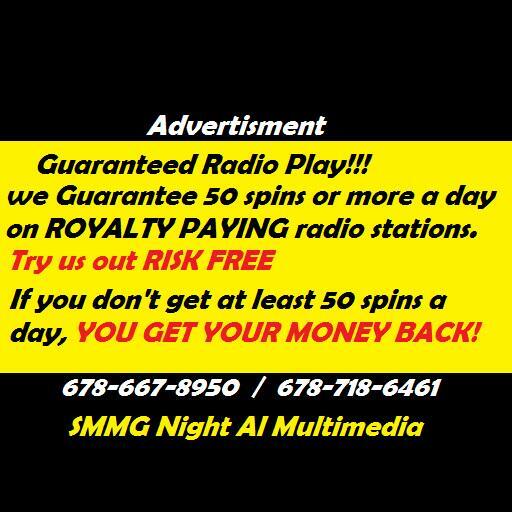 We also guarantee your songs get 50 spins or more a day. That's over 300 spins a week & 1200+ a month. We don't just send your music out in emails hoping the radio station will play it, we actually have a good relationship with many hip hop and R&B radio station across the world. We also have a heavy hitter package. $12,000 we guarantee 300+ spins a day To get started now using your credit or debit card. Use PayPal to send amount of desired package to swisha101@Yahoo.com :to request an invoice by email or would like to pay by phone, call (678) 718-6461 Single song packages: 14 days risk free trial, 50+ spins a day $500 30 days risk free trial, 50+ spins a day $850 Heavy Hitter 14 days risk free trial, 300+ spins a day $4,000 30 days risk free trial, 300+ spins a day $7,000 After payment has been made, you may attach songs to email and send to nightalradio@gmail.com To expedite service, you may fill out form below.